The White House has been pushing back hard against the unflattering portrayal of the president in "Fire and Fury," a supposed tell-all book by Michael Wolff that extensively quotes former top Trump adviser Steve Bannon. White House has been pushing back hard against the unflattering portrayal of Trump in "Fire and Fury"
Washington: President Donald Trump on Sunday assailed as a "Fake Book" an explosive behind-the-scenes account that questions his fitness for office, as allies lined up to defend the US leader, with one dubbing him a "political genius." Bannon, facing intense fire from the White House, issued a statement Sunday expressing "unwavering" support for the president. He said his reported criticism of a meeting between son Donald Trump Jr. and a Russian lawyer as "treasonous" was aimed mainly at another campaign aide who should have known the Russians "are not our friends." But Bannon's statement to the Axios news website did not specifically deny any of his reported comments, nor did it contain a forthright apology for his part in touching off the buzzsaw of criticism spawned by the book. 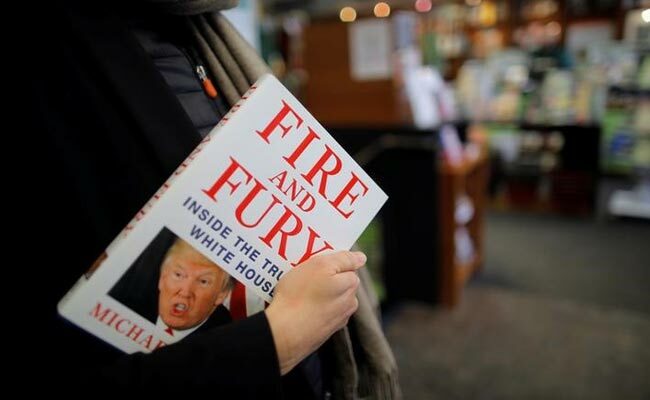 Trump tweeted Sunday that the instant bestseller -- which paints him as disengaged, ill-informed and unstable, with signs of serious memory loss -- was a "Fake Book, written by a totally discredited author." A day earlier, seeking to refute Wolff's suggestion that he lacked stability, Trump called himself a "very stable genius." Senior Trump policy adviser Stephen Miller treated the book derisively while insisting that his boss was in fact "a political genius," in an interview with CNN on Sunday. Wolff, Miller said, "is a garbage author of a garbage book." He assailed Bannon, reportedly a key source for the author, as "vindictive" and "out of touch with reality." Wolff defended his work on Sunday, telling NBC he "absolutely did not" violate any off-the-record agreements in his reporting but conceding, of the total three hours he said he spent with Trump, that the president "probably did not think of them as interviews." He also portrayed a high level of concern in the White House over whether Trump risks being removed from office as unfit, as is possible -- if difficult -- under the constitution's 25th Amendment. Almost daily, he said, White House aides would say, "We're not at a 25th Amendment level yet." Nikki Haley, the US ambassador to the United Nations, rejected that notion, telling ABC that no one at the White House "questions the stability of the president." She suggested that Wolff was someone who would "lie for money and for power." But Wolff insisted he did not enter the book project with an anti-Trump bias or agenda. "I would have been delighted to have written a contrarian account here: 'Donald Trump, this unexpected president, is actually going to succeed.' Okay, that's not the story. He is not going to succeed. This is worse than everybody thought." Meantime, CIA director Mike Pompeo, appearing on Fox News Sunday, insisted that Wolff's portrayal of Trump was "just pure fantasy." Far from being detached and unable to deal with complex policy issues, Pompeo said, "The president is engaged, he understands the complexity, he asks really difficult questions of our team at the CIA." He described Trump as an "avid consumer" of the agency's intelligence. Pompeo added that Trump was "completely fit," saying it was "ludicrous" to suggest otherwise. But in a possible sign of White House sensitivities over the book, Miller lashed out in an unusually raw clash with his CNN interviewer, Jake Tapper. When Tapper attempted to question Miller about his work with Bannon, the interview deteriorated into a rapid-fire series of mutual interruptions and recriminations. Miller called Tapper "condescending" and "snide," and accused CNN of engaging in "negative anti-Trump hysterical coverage" and "spectacularly embarrassing false reporting." The two men repeatedly spoke over each other before Tapper declared, "I think I've wasted enough of my viewers' time. Thank you, Stephen," then turned away from Miller -- who was still talking -- to tersely announce the next guest. Miller was not treated kindly in Wolff's book. The author wrote that Miller "was supposed to be the house intellectual but was militantly unread. He was supposed to be a communications specialist, but he antagonized almost everyone." Miller's combative performance on CNN got a thumbs up from his boss. "Jake Tapper of Fake News CNN just got destroyed in his interview with Stephen Miller of the Trump Administration. Watch the hatred and unfairness of this CNN flunky!" Trump tweeted after the segment aired.